I am torn between writing lengthy posts of my trip in Sri Lanka and keeping these daily Project 365 entries short as usual. Perhaps it would be best that I write on the trip fully as separate stand alone travel articles, where I would have more photos to go with the entries too. Sounds like an idea? 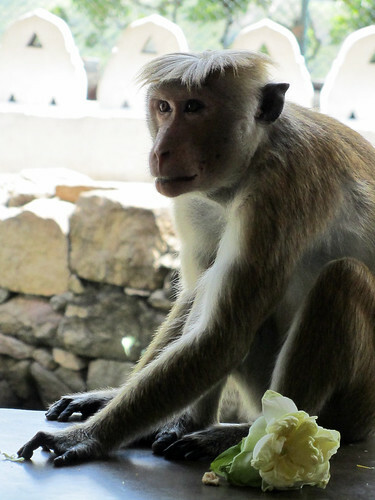 There are quite a lot of monkeys running around at the Dambulla Cave Temple complex where Claire and I spent our second afternoon in Sri Lanka. They are constantly on the move, some even involved in play (that looks more like fighting – they don’t play nice), and a few of them constantly checking out new food sources. By that, I mean the flowers offered by the visiting pilgrims. They keep sneaking in and out of the caves, and quickly swiped fresh flowers off the table to take away for a snack. Very cheeky indeed. Sure, sounds like a great idea :) But will you have the time?? Fingers crossed! time is always at a premium… will have to try, no?